Got a sweet tooth? Looking forward to your little bit of chocolate from your advent calendar each morning? Well, you’re in luck. 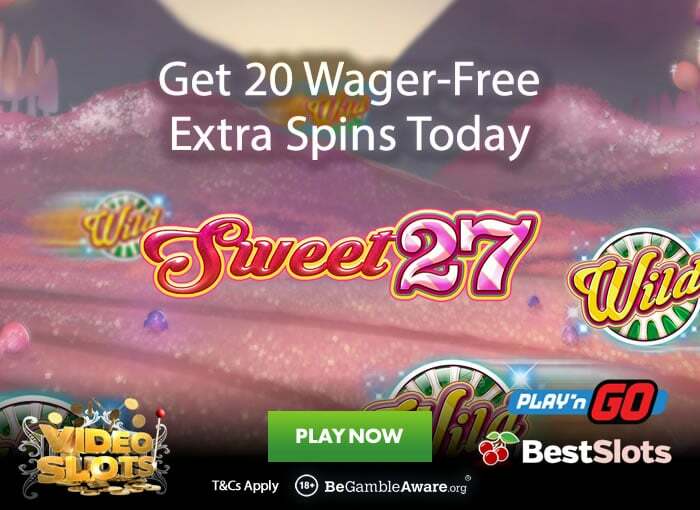 As part of the Christmas Calendar promotion at Videoslots Casino, they are giving you 20 extra spins on the Sweet 27 slot game with no wagering requirements. Yes, you read that right – 20 extra spins which are wager-free. Wager-free meaning no wagering requirements which means whatever you win is yours to keep or cashout. To get your 20 extra spins, you need to simply deposit £20 or more today (Wednesday the 5th of December 2018) at Videoslots Casino. It’s that simple. Sweet 27 is powered by Play ‘N Go and has 3 reels and 27 paylines. With a sweet and retro feel, you can spin away from just 10p per spin across desktop, mobile and tablet devices. The main symbol is the wild which rolls in the Free Spins feature. Videoslots Casino is home to over 3,000 slot games – yes, that’s correct. If you want to play new titles, they offer you Arctic Race by Novomatic, Action Ops: Snow & Sable from Microgaming, Valkyrie from ELK Studios, Rocket Fellas Inc from Thunderkick and Vikings by Net Entertainment. Not got an account? They treat their players to £90,000 worth of weekly casino races, a weekend booster where you can win up to £300 per day and the best customer support in the industry (they’ve won numerous awards such as the Best Casino of the Year for the last 3 years). They also process your cashouts within hours! Sign up now to get a 100% welcome bonus up to £200 plus 11 wager-free extra spins on Starburst.